Easy crock pot meals are perfect comfort food for winter, and can be prepared in just a few minutes! 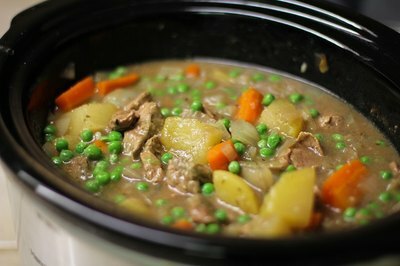 This Crock Pot Irish Stew includes lamb and potatoes for a rich, filling, and delicious meal. 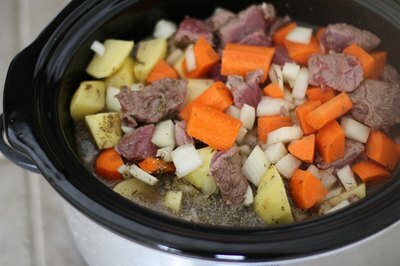 Simply brown the meat and add all of the ingredients for the stew to a large crock pot. Prepare the recipe in the morning and allow it to cook all day while you're at work. You'll come home to a delightful, no-fuss meal! Once finished, the stew turns out thick and full of flavor. The recipe serves 6 to 8 people comfortably, making it a great meal to serve to guests. 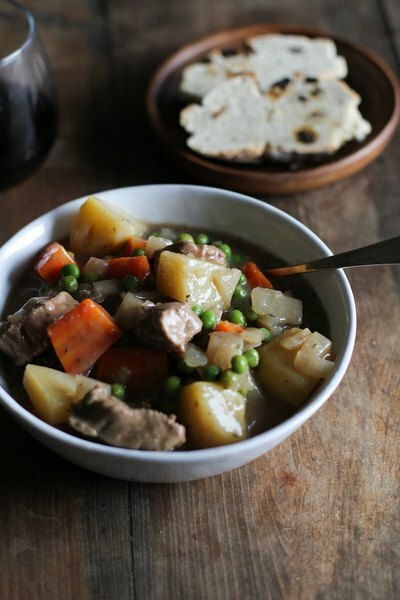 Don't forget to serve the stew with Irish Soda Bread and butter, or your rustic bread of choice. 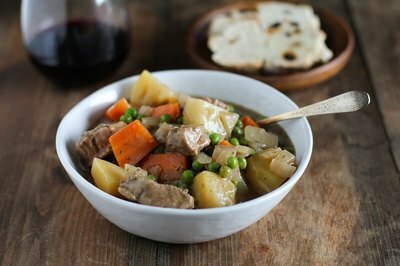 Make this Irish stew for St. Patrick's Day, or any time you're in the mood for a hearty meal. Heat olive oil to medium-high in a skillet and add the lamb meat. Brown the meat for about 30 seconds - avoid cooking the meat through so that it stays tender in the crock pot. 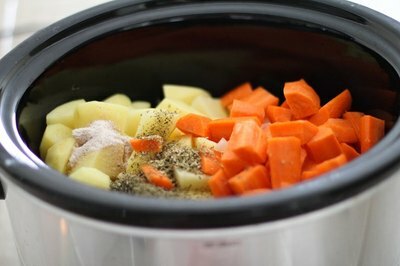 Add the chopped onions, carrots, celery, potatoes, minced garlic, dried thyme, oregano, and salt to a large (6-quart) crock pot. Add the browned meat and beef broth to the crock pot. Stir well, secure the lid, and cook on low for 8 to 10 hours. 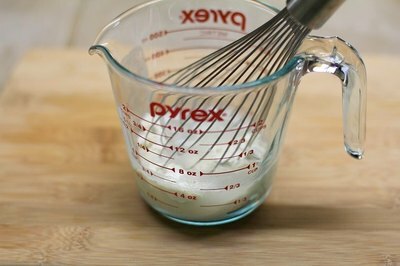 Whisk together 1/2 cup of all-purpose flour with 1/2 cup water until the flour is dissolved. Turn the crock pot to high and add the flour mixture. Stir well until combined. Add the frozen peas. Replace the crock pot cover, and cook an additional 20 minutes. Taste the stew for flavor. Add additional sea salt if desired. Serve heaping bowls of stew with rustic bread (such as Irish Soda Bread). 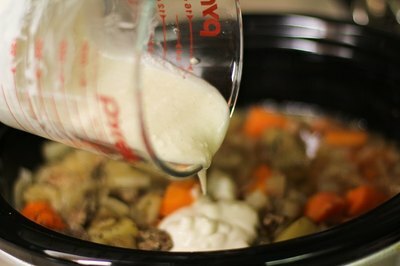 If desired, add a dollop of sour cream or Greek yogurt to each bowl. Optional Step: Saute the onion, carrot, and celery in 2 tablespoons of olive oil for 8 to 10 minutes over medium heat prior to adding the vegetables to the crock pot. This will bring out the flavor of the onion and help to soften the vegetables. If using regular beef broth instead of low-sodium, decrease the amount of added sea salt to 1/2 teaspoon, or to taste. In order to ensure your lamb meat stays nice and tender, be sure you don't cook it through during the browning process. It only takes a few seconds to brown the meat.